Something I am painfully learning….You can’t continually publish your own books without selling them, you cannot sell books without marketing, and when you are self-published you must do the marketing yourself. My sister Liz said last week that I better get narcissistic about it. She was one hundred percent correct. I’m sure my friends on Facebook are sick and tired of links to Amazon. But until I can force myself to stand out in front of Barnes and Noble with a stack of flyers, or go on our local radio station and tout my praises and those of my books, Facebook and Twitter are all a hermit has. I love pinterest, and pinned the books there, and actually got some repinnings. 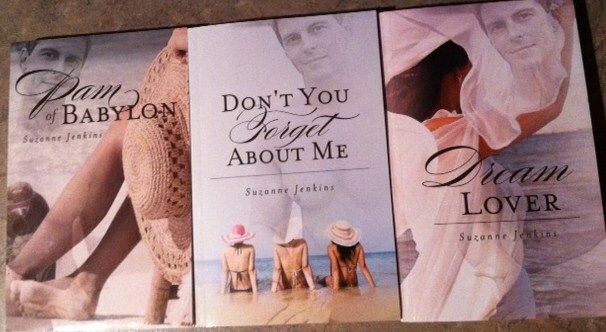 Now I am doing a book giveaway on Facebook, Twitter, Goodreads and my Suzanne Jenkins website. I will do it here, too. All you have to do is comment and I’ll enter you in the contest. My readers have faithfully shown up, read the droning and commented or not. So this is sort of an apology for blasting you day in and day out with book stuff. I’m a writer, not a marketer, but I must do it or stop publishing. And that would be no fun!!! I love you, friends. Personally I haven’t felt spammed at all. I think it’s very exciting that you are a published writer!! !